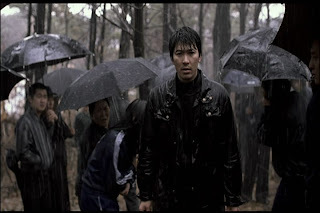 Police procedurals, that sub-genre of films that seems to dip in and out of mystery, action, thriller and noir, has rarely seen so sophisticated an entry as “Memories of Murder” (2003) from South Korea. Perhaps the best part, at least for most audiences, is that “Memories of Murder” is not bogged down by pretentiousness, loud art house shenanigans or stylistic excess. It has a sense of realism relative to most modern thrillers that is enhanced by the based-on-a-real-case premise. 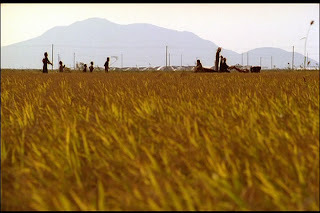 The film heralds from South Korea and was directed by Bong Joon-ho (adapting from a 1996 play) who is now fairly famous in the West for his 2006 blockbuster “The Host,” a mildly disappointing sci-fi film that delivered on what it promised without going far beyond. Like the “The Host,” Joon-ho’s film is essentially a genre picture albeit one crafted with a rare level of intelligence, symbolism, depth and aesthetic perfectionism more common to high-brow art films and prestige pictures. 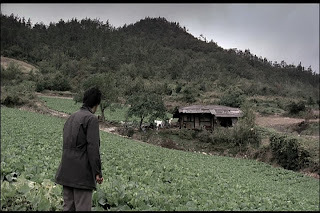 In the film (as in real life from 1986 to 1991), a serial killer rapes and kill women in the small (compared to Seoul) village of Hwaseong in the Gyeonggi province. 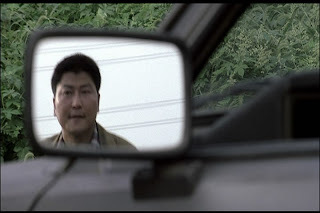 Kang-ho Song plays Detective Park Doo-Man, the local cop put in charge of the case. His freestyle approach of corrupt practices, brute force methods and dubious intuition seems terribly backwater, but his two year college education and gung-ho attitude make his the most qualified man in town. When he’s joined by Detective Seo Tae-yoon (Sang-kyung Kim), a methodical professional from Seoul, there is an inevitable conflict of style. Bong wisely keeps the city cop vs. local cop friction off center stage, only using it for humor or tension when it could also advance the plot or add real insight into the characters. Seo paces around quietly in the background of many of their early shared scenes, simply observing Park as he plants evidence or beats suspects and not reprimanding him except to confront him with genuine deductions. Their evolving friendship is handled gracefully, with a sense of exasperation and understanding more so than camaraderie. The mystery itself is quite compelling. As corpses of women start to turn up with undeniable frequency a pattern emerges: the victims were all young women, wore red, and were strangled in the rain while a particular song played on the radio. Bong initially blames a local mentally challenged boy and plants evidence to seal the case. While attempting to stage a re-enactment Seo reveals that the boy is almost certainly innocent: his defective hands could not have strangled anyone. “To Kill a Mocking Bird” anyone? Pretty soon a riot ensues, bungling the performance in front of the press. The next suspect is a drunken pervert who suspiciously shows up at the crime scene late at night. Another lead takes them to a woman with a secret she has been guarding long enough for it to turn into a local legend. Later, the police begin to suspect an effeminate young man fresh from his mandatory military service. I won’t reveal which (if any) of these people actually committed the crime (of course, you could always look up the real case), but I will say that Bong orchestrates the conclusion with remarkable finesse. His final scenes are the perfect ending for a late-modern thriller, a devastatingly delivered ‘twist’ that has unsettling implications and is likely to cause the audience to react quite differently than they would for the average crime mystery. Perhaps even more than the final revelation, it is the lineup of the suspects that that reveals the most. Park jumps immediately to conclusion when confronted with anyone who deviates from the clean-cut norm of society. His rough accusations, aimed at the handicapped, perverted or simply unusual, exposes his deep-rooted biases that make intuition all but worthless. Driven by a need to capture the killer, Park crosses the line far too easily and too often, resorting quickly to tactics that violate basic human and legal rights. Bong seems strangely ambivalent to his character’s recurrent miscarriages of justice. Even Cho Yong-koo, a violent and simple-minded detective who executes most of the kicks, beatings and torture sessions meant to hurt the truth out of their targets, is saved from condemnation at the last minute. He ends up undergoing a sad comeuppance that earns him sympathy. 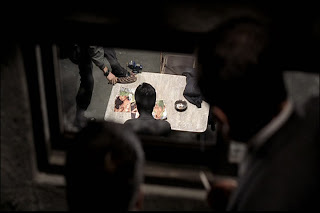 All three of the detectives actively go too far, with even Seo learning the provincial violence bred by frustration so evident in Park’s jaded sense of justice even as Park picks up the advanced forensic techniques and dogged determinism of Seo. While initially the planting of evidence and abusive extortion of confessions turns us off to the characters, their violence assumes a strangely human face in the light of their own desperation and righteous anger. 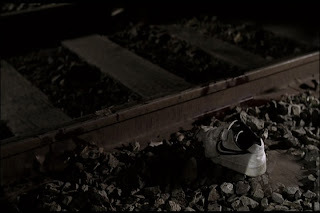 Bong uses shoes as the symbol for their overly-aggressive, though essentially impotent, investigation and their long chain of failures, false leads and added harm. The unusual choice of synecdoche may come from its particular history of association with cops: ‘flat foots,’ ‘gumshoes,’ etc. 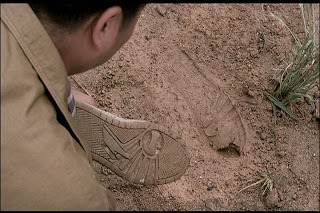 Bong returns to brief well-placed shots of footwear (see images) when he wants to show us that the detective, despite their intentions, may be doing more harm than good. 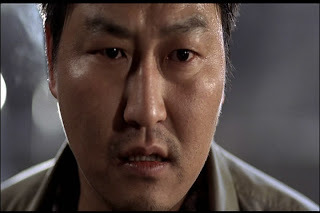 The faulty logic and general inadequacy of their brute force system is verbalized in a scene where Park drunkenly suggests that America has to solve their crimes by thinking hard and applying science because they have no choice, while Koreans can simply put in the footwork and cover their whole country. If the shoe is the symbol of the inadvertent perpetrator of injustice, the color red is the mark of the innocent victim. 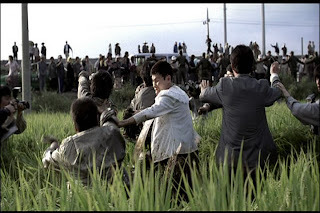 Bong uses tiny flecks of crimson (and not just blood, a fact that shows admirable restraint) in green and gray toned scenes to emphasize the jarring, intense shock of violence which strikes with piercing fatality and precision. While the color correspondence is not particularly subtle, the focused and discerning use of the motif keeps the vibrant slashes of red from seeming obvious or overdone. A different take on the pattern uses a cut from grays to red. It is one of the few hard cuts in the film, and also one of the only associative cuts, jumping from a graphic autopsy of a decomposing corpse to a pile of raw steak hitting a metal pan in an explosion of steam and sizzle. 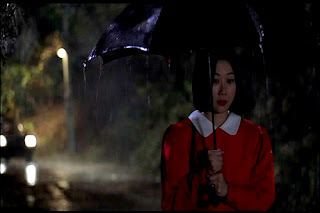 Though perhaps somewhat tasteless and explicit, the pair of shots is darkly comic and enforces the connection of red with victims. It also wryly dehumanizes the woman by linking the flesh from a grisly murder to that of an everyday meal. The idea is put forth that these local crimes, however atrocious on a personal scale, are symptomatic (or even emblematic) of the universal, day-to-day horrors amongst which the characters semi-obliviously live. Bong clearly has a lot on his mind and makes many references to the late 1980’s political, social and cultural turmoil that forms the context around the mystery. The integration of these elements fits seamlessly into the plot and hints at national troubles that dwarf the actions of the serial killer. For example, civil defense drills require a curfew and blackout to stymie aerial raids, but inadvertently allows the killer to work in the darkness and away from witnesses. The suppression of a demonstration calls away the extra garrisons that the police needs to hunt the murderer. At one point Seo visits a school to follow up on a lead and watches them conduct an Anthrax attack and evacuation drill. 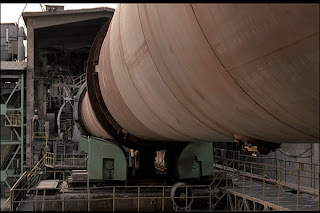 The largely off-screen threats: war, civil unrest and biological weapons, form an ominous backdrop that makes the individual murders nearly trivial, except to the local population who experience the crimes as vividly and cruelly concrete. The determined investigation of the case works as a displacement, a chance to strike some clear victory for the side of good amidst a world falling apart. Bong also takes light stabs at sexism against women in the workplace and the failure of parents to properly care for their children amongst other topics. Always, these gentle pokes at modern society and culture are packaged unobtrusively into the plot. Bong never draws the film to a halt or pulls up a preaching pedestal to deliver his message. He does something far more effective: he entertains. 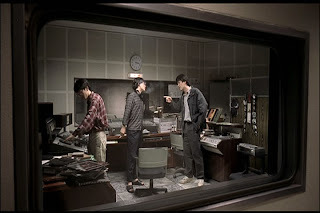 Kang-ho Song as Park and Sang-kyung Kim as Seo both turn in great, though not flawless, performances. Song put on 22 pounds to sell his role as a bulky, somewhat slovenly local detective with a misguided intuition and unreliable moral compass. His complicated character is brought to life in plenty of detail, but his naivety and confidence sometimes go too far and caricaturize him gratuitously as a buff hick cop. Kim’s role isn’t nearly as showy or deep though he does get a chance to show his emotions by the end. His quiet, contemplative detective is low on memorable moments, but I loved one dolly-out in the rain that is carried by his stunned and demoralized expression. 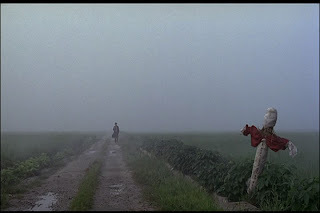 That scene, like so many others in “Memories of Murder” wouldn’t be nearly as powerful if it weren’t for Kim Hyeong-gyu’s crisp cinematography. Without necessarily resorting to abrupt juxtapositions, Kim manages to oscillate impeccably between shallow focus close-ups that capture every pore and stubble and distant long shot landscapes of haunting beauty. The film feels so convincing and effective even when no action or dialogue is going on because the former shots allow the characters to shine while the latter gives a sense of detailed and exquisite geographical specificity. 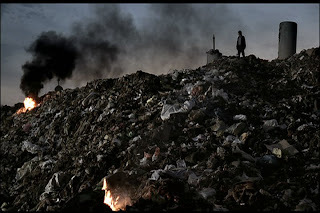 All of Bong’s long shots, rather they are being used to establish the setting, clarify the action over a large area or simply to create tone (rich nature rife with hidden crimes or urban wasteland full of anonymous evils), include a human character to provide a sense scale and depth. The characters are dwarfed quite literally, in environments that overwhelm them as easily as their circumstances. Even without the layers of meaning, the atmosphere and the utility of plot, Kim’s landscape photography is an aesthetic pleasure in itself. Bong and Kim are not so much interested in putting the camera in unusual positions or in distorting the image (like in giallos or Hong Kong cinema). Their work has plenty of style and artistic flair, but it is never arbitrary or distracting. The focus is on magnifying select fragments of reality with great fidelity, drawing us into the story, the action and the empathy needed to generate mood and emotion. 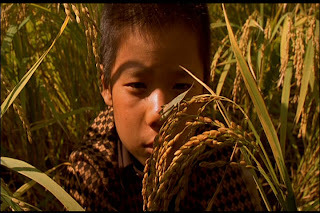 Bong often uses frame-within-a-frame camera positions that draw our eyes to the necessary action, while still allowing for arty compositions. Bong Joon-ho deserves a great deal of credit for creating one of the best all-around South Korean films and he justly earned both critical and popular praise (it was one the year’s top grosser in his home country). Though it doesn’t possess much in the way of originality, it stands as a high water mark as both a police procedural and modern noir, ranking close to such films as “Silence of the Lambs” (1991) and “Se7en” (1995). Yep, I definitely watched this, and I think I was even around for a second showing, but I don't think I paid full attention the second time. I seem to recall watching it at your old apartment and then maybe with Gavin back at the parents' house. Great stuff, though. Glad to hear you have seen it. I think SK has made lots of great movies in the last decade (and lots of crap and knockoffs too, of course) and this is one of my favorites. I also recommend Kim Ki-duk's films and "The President's Last Bang." Try some Hong Sang-soo (some reviews on my site), if you haven't already and you'd like to try more deliberate, artsy stuff. I found Memories of Murder for extremely cheap, and I think it has a high payoff. For a "twist movie" it has plenty of rewatchability and I find that its combination of action, mystery and art house modes makes it a hit for a wide variety of people (apparently all of SK) and almost any of my moods.